Late last week we learned that the president is so concerned about the caravan coming up from Mexico that he is rushing not 5,000 troops as originally reported but he upped it to 9,000 then 15,000. Yup, we got 15,000 troops going to our southern border in Operation Faithful Patriot. More than we have in Afghanistan. We also learned that 1,000 folks calling themselves Minutemen (I’m guessing the term is based on the Revolutionary War term and not their sexual prowess, but that is just a guess on my part) are going to the Arizona border to patrol a twenty three mile stretch. They say the border agents need their help and that they have a right to do it. On Saturday night we saw Laura Ingraham showing what that migrant caravan could do once it got to the border, how fast they were coming, and how they would overwhelm the border wall. 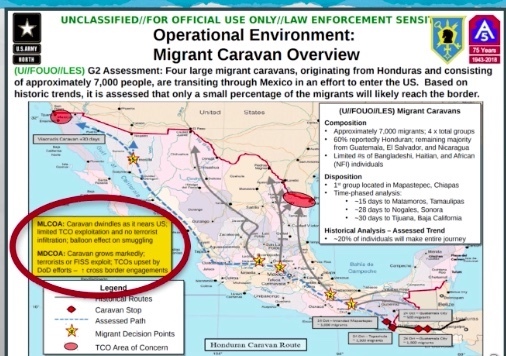 We also got the threat assessment from the Pentagon of what they think is “The Most Likely Course of Action” (MLCOA) for the caravan. Wow. There’s a lot to go through. It turns out that the late Saturday night Laura Ingraham report was false. It wasn’t even Laura Ingraham! It was on a show called Saturday Night Live. You may not have heard of it. It’s only been on for 43 years. There was a woman impersonating Laura, a lesbian! FAKE NEWS! Okay then there is the bit about the guys going to the border to “help” the border patrol. There is a video clip and a picture that I can’t get out of my mind. First the clip. It’s of a Border Patrol agent saying that having untrained people with guns on the border is dangerous and they, the Border Patrol, would rather not have them there. The Second is a picture of a guy who is fatter than Chris Christy before he lost any weight with a gun in a holster. 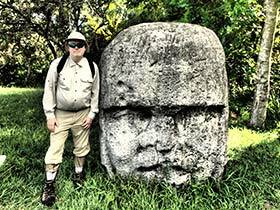 He’s one of the Minutemen at the border. What could go wrong? Also, we got the inside scoop on the military assessment of the threat posed by the caravan. This is the MLCOA 271999ROCT18 from the JFLCC TOC of the DoD. Need I say more? It’s the Most Likely Course Of Action. From it’s Tactical Operations Center. Not only does this document tell us what the military thinks is the most likely scenario of what will happen to the caravan, but also it’s cost, and the biggest threat it faces. Lemme break it all down for you, because this is NOT FAKE NEWS. This is THE TRUTH from our military that we pay for with our tax dollars. The military estimate of the time to reach the closest point on our border is in excess of 30 days. They are 800 miles away from that point. The more likely crossing point is 1200 miles away. The military assessment* is that less than 20% of those in the caravan will actually get to our border. The estimate of the size of the caravan is 7,000. Twenty percent is 1,400 people. Our military will outnumber them over ten to one. Do you think that is enough? I mean someone in the caravan may be holding a rock, and we might need that many military because they are not allowed to use their guns on U.S. soil. Some law or constitution thing. * This is the Threat Fusion Running Estimate** JOA from the U.S. Army North***. ** Sounds like a modern day Indian name. *** Not to be confused with the Civil War, Army of the North. What is the most likely threat the military faces on the border? What is the biggest, baddest, most likely threat from our military being on the border? I’m surprised the president and Fox News haven’t been all over this. Not to mention those militia men sites. The military’s past experience with these folks is this … wait for it …. Those militia members steal from our military. I guess that fat f*ck needs a new belt. Cost estimates for this operation are hard to assess as the time spent at the border is not known, but current published assessments are $200,000,000.00 by year end. You know for 200 million you could feed a lot of refugees. You could even go to the countries that have the problems and start fixing the problems that caused those people to flee their countries in the first place. I mean when you dig into it. It seems many of the problems were started by our government in the first place. is the more likely headline. Vote on Tuesday. Go to your polling place.